The top of the table Women’s Pool 1 clash between the reigning world champs the Canada Northern Lights and the International Cup debutants the Great Britain Swans – on a breezy but mostly sunny day with an early taste of Melbourne Spring in the air – the venue the Plenty Oval, home of the Victorian Womens club the powerful Diamond Creek. Last tournament this venue hosted the Banshees vs the Liberty. With respect to that previous encounter – this match is a super important fixture. The winner will ensure the advantage in the semi-finals on Tuesday. The loser likely to face up to Ireland in the other semi. The Northern Lights going in as favourites but the Brits full of hope to pull off an upset. Winning the toss – Aimee Legault opted to kick with the stiffening breeze that favoured the city or southern end of the ground. Running North-South, the trade-off being that the forwards would be looking into the midday sun. The two sides match up pretty-well size wise – however the Canadians would be expected to shade the Brits in general skill. The first quarter was largely dominated by the Canadians and played predominantly in their forward half. The Brits were finding it a tough ask to work the ball into the breeze. How-ever the Canadians were getting caught out wide around the boundary where the Brits were more than happy to see the ball. Instead of long kicks to marking forwards – the ground ball was proving the key. Valerie Moreau (#5) was in everything and opened the scoring for the Lights with a snapped behind. The other stand out early was the number 8 in Nicola Kirwan. The Brits were under pressure to clear and Kirwan snapped another behind after an intercepted kick in but moments later went one better and snapped the opening goal. The Brits managed a couple of forays forward but were repelled each time – with Sarah Ennor (#32), Rolfe (#16) and Nguyen (#31) teaming up well in defence and relative newcomer Kirsti Oja (#34) and Jaclyn Halliday (#20) important in transitioning back into attack. How-ever after another 2 behinds (via Moreau and Kirwan) – it looked as though the Lights might be wasting the advantage. Again it was Moreau getting an important touch, the snap towards goal was heading in the right direction when Hilary Perry (#12) tapped in off the ground to push the lead out to 16 points. One more behind via Kirwan – and that was the quarter time score. All the damage had been achieved via ground level work. It must be said that Lights skipper Aimee Legault (#10) is as tough as you could ask for – and invariably was lifting herself from the ground after a tough contest or a knock that would send many others to the bench – her movements remind me of Sam Mitchell – and her repeat efforts and competitiveness is obvious to all – and is never out of the contest including working the mark vigilantly and effectively. The Lights #1 Nicole Robertson provided everyone around the ground with a nervous moment when she marked the ball over the line only to crash into the fence. 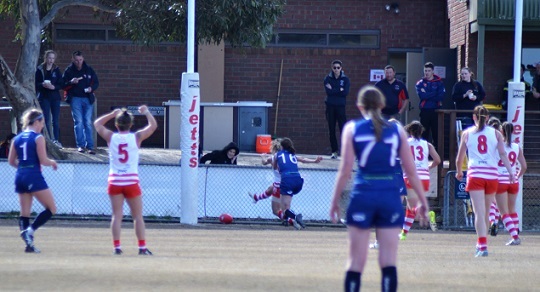 Unfortunately for the Lights Tricia Rolfe (#16) was helped from the ground after going down on an ankle. A couple of other stand outs for the Lights were Hilmi (#24) who thrives on the physical contests – sometimes taking on one tackler too many – and Vansevenant (#25). For the Brits – a largely scrappy quarter with few stand outs however across the board the pressure and tackling was limiting the Lights effectiveness. 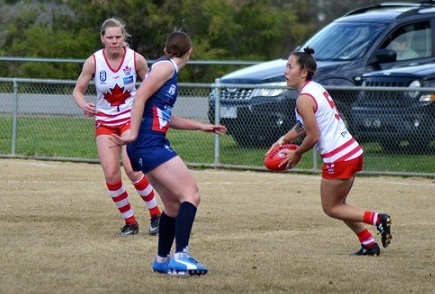 Hocking (#8) was competing strongly and Rania Ramadan (#14) in the ruck was working hard. However at quarter time the Brits forward coach was displeased with how easy the ball had come out of the forward line after the hard work to get it there against the wind. The big question for the 2nd term was what the Brits could do with their turn with the breeze. An early mark and shot at goal from Alex Saulter (#71) fell short and was cleared by the Lights - however Swans #8 Frankie Hocking intercept marked the clearance between wing and half forward – and with the benefit of a 25m penalty – sent the ball long but just off line but the Swans were on the board. The forward 50 contests were fierce however the Brits were lacking the class of ground level forwards that had been so dangerous for the Lights. And when the Canadians transition to their end it was via some of the usual suspects; a strong contested mark to Hilmi, a give by hand to the creative Moreau – and contest won by Kirwan and a give to Nguyen – suddenly Robertson (recovered from the fence incident) was running goalward – the kick went astray but it stayed in the forward 50. From the stoppage it was the ever dangerous Kirwan who put it through with a super classy right foot snap from the pocket – in front of the onlooking Diamond Creekers – the ever valuable goal against the wind – in these conditions, perhaps worth 2 at the other. Both teams are well coached the interchange benches were working overtime especially with the coaches having an eye on the key match ups. 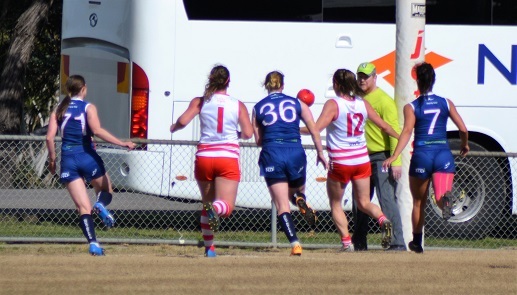 The Lights having the luxury of rotating Moreau and Perry through the midfield, and the influential Hilmi was nullifying the impact of Swans skipper Laura Turner (#34). 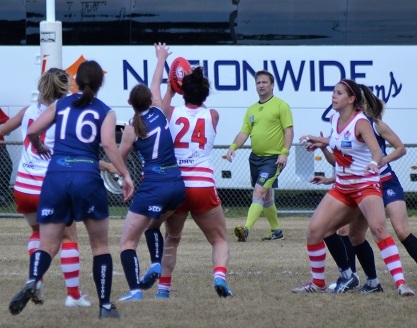 The Brits were getting their hands on the ball – Melanie McDevitt (#19), Kirsty Gray (#81) amongst them but every disposal was pressured – the tackling of Denah Arnold (#13) and Chantal Beaudin (#14) stopping the Brits in their tracks and creating stoppages. From one of these it was Hilmi who cleared and booted forward – Legault playing in front marked and gave off to the running Willis (#37) but the kick went wide – but with 1.1 to 0.1 to this point – against the wind – the Brits were in danger of losing the quarter. The Canadians again pumped the ball into attack via Alanna Robertson (#26) and Hilmi. 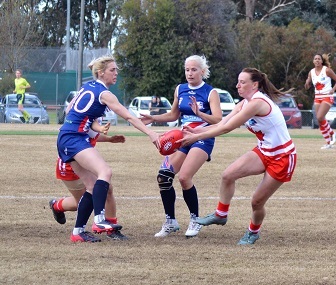 This time the Brits repelled – and a centre wing high tackle on Freya Blount (#2) allowed the Swans to pushed deep forward. 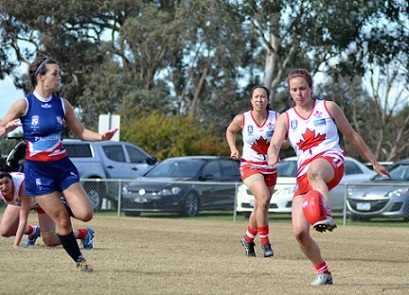 Beth Bailey (#16) was warming to the contest for the Swans but they couldn’t get past the Lights defence. Finally it was Ramadan who from a set shot managed their second score – but again just a minor. When Gray got in the action again – incepting a kick in – the Brits were unlucky with the ball touched through. A final chance after the siren saw Bennett (#3) taking a long shot but despite the breeze at her back the ball fell short and the 21 point deficit at the main break put the game very much in the Canadians corner. The third quarter could have blown the game wide open – however the breeze seemed to fade and the Brits took comfort and lifted their defensive rating. However the early lowlight was a high contact on Gray when the Brits had pushed inside F50. Helped from the ground by trainers with a nick to the forehead – the question mark clearly upon whether she would be able to return. Alannah Blount (#23) took the free kick, it fell short, Turner crumbed and her snap to the top of the square could so easily have been marked. The Brits were forcing repeat entries – Hocking sent the ball back in but this time there was no Swan nearby. When Bennett delivered to Ramadan – the resulting free was contested on the goal line – on another day Stacey Hughes (#12) might have marked and goaled – but today the austere Canadian defence weren’t willing to concede even a behind against the wind. They forced it wide to the defensive eastern pocket – in front of the club rooms. It was the Canadians turn now to attack but the Brits initially repelled – only for the skipper Legault to intercept and dish off a handball to Hilmi who chipped around the corner to Kirwan – however -again the Canadians had worked themselves wide and the shot from Kirwan was about a metre inside the boundary about 45 out. It did result in the first score of the term. Meanwhile for the Brits – Kirsty Gray was undergoing concussion testing – and passing – she would soon return to the field with her head wrapped up. The British defensive pressure was a highlight – big and repeated tackles from the likes of Bennett and Ramadan were stifling the Canadians flare. One more behind to Canada via a soccer out of congestion and that was it for the quarter. 2 behinds only with the wind and perhaps the Brits had bought themselves a real crack at this game. Did they have 4 goals in them with the breeze. Their coach hoped so. The final term promised much – alas the Canadians still had plenty of run in them early and were not letting the Brits play it on their terms. When Legault ran on to the ball and used her soccer skills to tap it forward and following up won the foot race to tap in for a goal off the ground – under heavy pressure from Bailey – the early goal against the wind would prove a bridge too far for the brave Swans. A couple more behinds to the Canadians via Perry and Kirwan would see out the scoring for the afternoon. The Canadians had shown a superiority in clean ball use. The Brits were very competitive, but under pressure their hand ball was more often for survival than for creating opportunities. 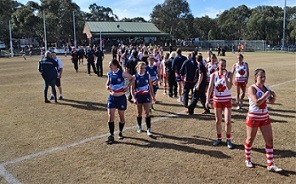 The Canadian coach Jason Arnold was pleased with the performance of his chargers – including the strong midfield rotations and made particular mention of Kirsti Oja whose athleticism and skill were a feature of the afternoon. The week ahead will see the Northern Lights taking on the Pool B second place USA Freedom. 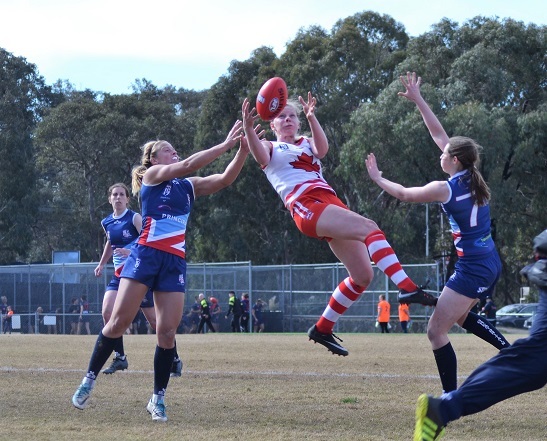 The Swans need to get up for a tough assignment against the Irish Banshees. For all side – recovery and player management is crucial with very little recovery time leading into what looks set to be a wet old Tuesday at Royal Park. The goal of playing at Etihad next Saturday.